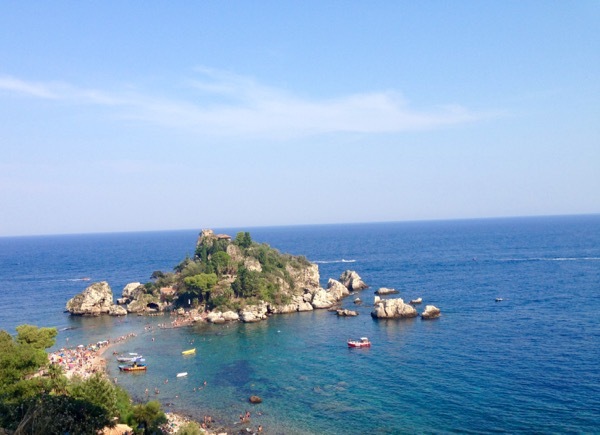 A collection of photos and videos from our Sicily Travel adventure + 7 things to do in Taormina the jewel of the Mediterranean ! When we decided on going to Sicily this summer we really wanted to get away from it all. We were not after the fanciest hotels and resorts as after a while they all look pretty much the same. So much so that it doesn’t really make much difference if we go to Sicily or Miami. 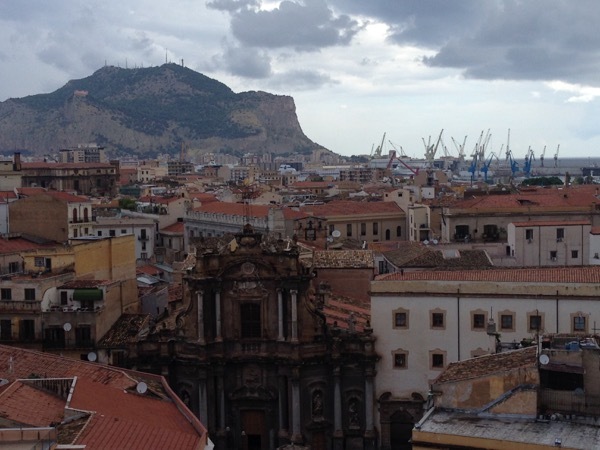 The first night We rested our heads in a charming little hotel in the center of Palermo, Hotel Ambasciatori ! 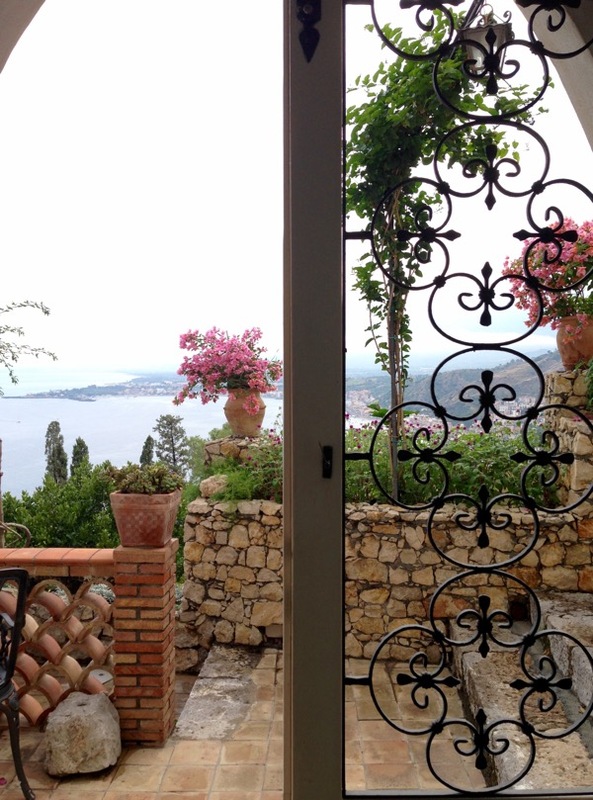 Old wooden elevators, simple furniture, tall ceilings, spacious rooms, and a spectacular terrace view with a whiff of old Sicily all around it, the perfect setting for two lovebirds looking for shelter from the mid August pouring rains. A walk to the Champagnerie for a late night pizza and drinks in front of the Teatro Massimo is the perfect way to intertwine your stay with the fabric of the Palermitane(I) lives. 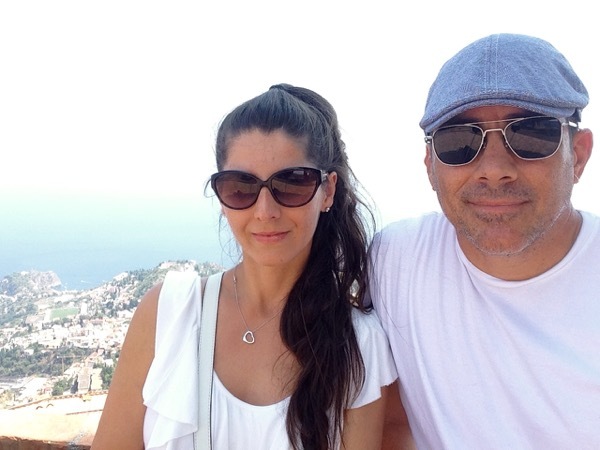 The next morning we were on a bus to Messina and a short train ride to Taormina. We took a cab up the mountain to Hotel Bel Soggiorno, an old Italian villa standing there since 1908. 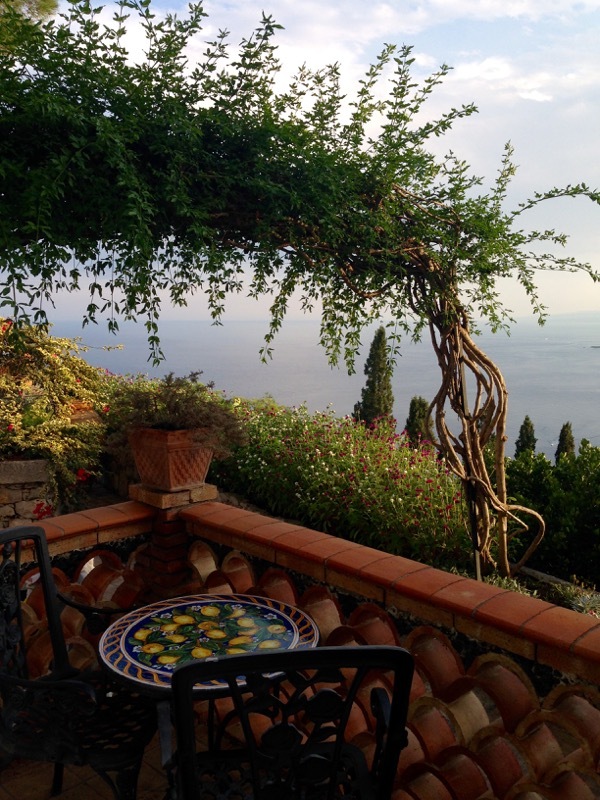 Gorgeous wrought iron veranda , our own terrace with breathtaking panoramic views of the sea and Mount Etna. Just what my soul was searching for. 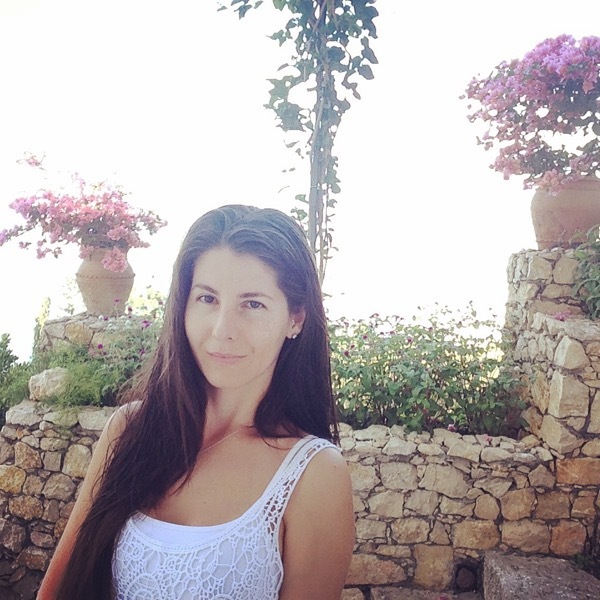 Drying my hair and my clothes in the fresh morning sea breeze and enjoying endless meals of Sicilian tomatoes and freshly picked basil from outside our bedroom door, just a couple of lines off of my bucket list of things to do in Taormina ! 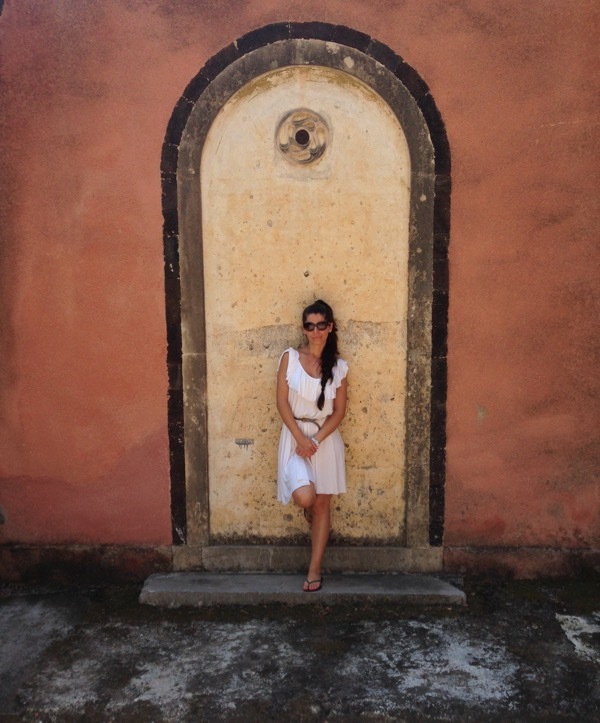 Here is my Sicily Travel list – have done them all! 1. Eat Sicilian Cannoli, only the best will do at Roberto’s. Stuffed in front of your eyes with real fresh ricotta. While you are at it grab some real nougat to go. 2. 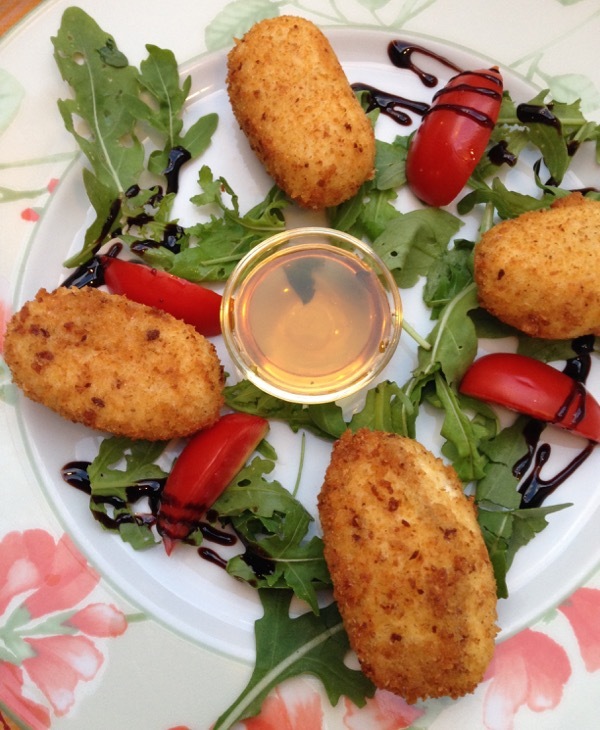 Have dinner at al Giardino Ristorante, a family run restaurant with simple but delicious Sicilian cuisine. Must ask for the ricotta fritters ! 3. 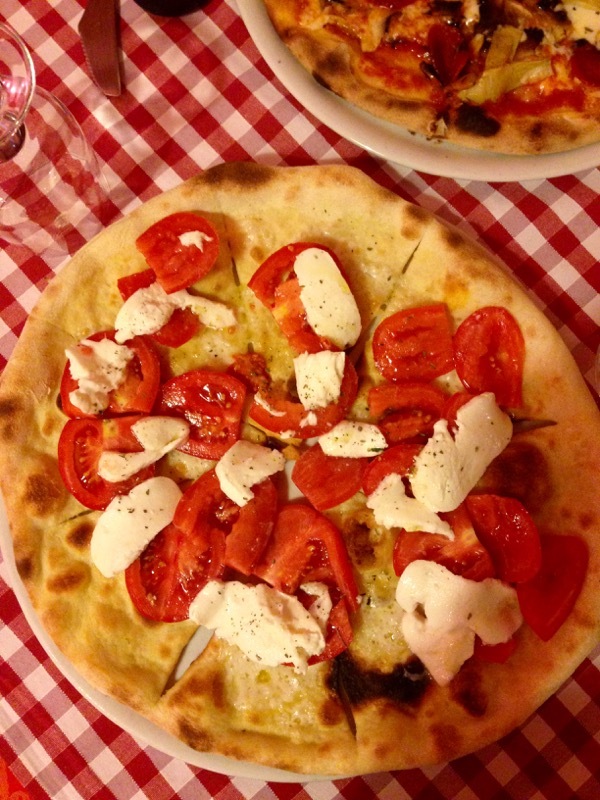 Have Pizza at Santa Lucia Trattoria -Pizzeria on Via Cappuccini , 8 Taormina Sicily. A simple Sicilian pizza parlor where the locals go. Hidden on a side street away from your topical tourist trap this tiny restaurant is a hidden gem. Don’t expect anything fancy but at least a 30 minute wait, because this pizza is the real deal, the best pizza you’ll ever have in your life. This is the real deal kids ! 4. 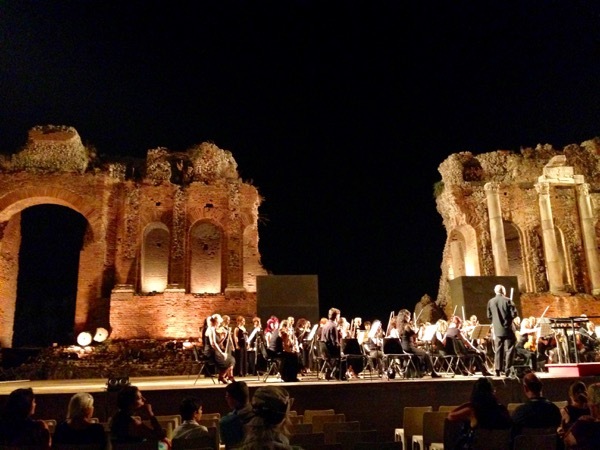 Go to the Opera at the Teatro Antico Di Taormina. The ancient theater of Taormina from the Greek period, under the stars by the sea, an unmatched experience in an absolute picturesque location. 5. Visit Castel Mola, rarely visited by non-Sicilians, this is a fascinating place with breathtaking views and so much history. 6. Get your Italian custom handmade sandals by Luigi at Bottega Del Sandalo on Via Bagnoli Croce, 30 – Taormina. This one is for the ladies along with strolling up and down Corso Umberto, the Main Street in Taormina filled with shops and terraces. Lovely lovely lovely. And you look so relaxed. That theatre almost made me cry. MUST get there. 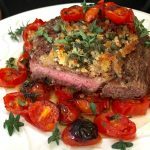 Oh my gosh – The FOOD and the lovely scenery! I hope that I can make it to Sicily someday. It’s where my family is from and it is just so pretty! I went to Italy right after high school and I feel like I didn’t fully appreciate how amazing it is. I’m dying to go back and now I really want to go to Sicily! Florentina I am SO jealous! You travel exactly as My husband and I have in Mexico. We would love to go to Italy and maybe will someday. In the meantime I will enjoy your travels through your videos and pictures. I LOVE the hotels you stayed in. Such charm and cultural perspective in the old ones. Thank you for sharing your adventures! I love Mexico ! That’s our InstaTravel location. We need to swap Mexico travel tips ! 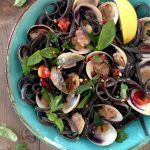 These photos of Sicily are phenomenal; my only question is, how could you stop at 7 things to do?! Very nicely done, thank you for taking us here! Great question!! I had to contain myself and keep the post to a digestable length (I hope that makes sense ). But you are right, 7 is just a number, I could have done a Top 100 List here for sure haha ! This looks like an amazing trip! I’ve never been, but certainly hope to some day!! aww thank you ! My iphone is my best friend ! Hi, Florentina! First of all, you look so beautiful in all your pictures! I love that white dress! Second, I am sooo jealous of your Italian journeys. I agree that the best way to see Italy (or any place for that matter ) is to do it the way the locals would. You get so much more out of it that way. awww thank you Sarah, I’m blushing 😉 I love that white dress too, mostly b/c it is so comfortable and summery and easy to pack. And then b/c I got a killer deal online last year, like 80% off. Hehe, it’s how i do ! Locals are your best friend when you travel anywhere, or you will find yourself in a tourist trap at every corner, experiencing nothing but a commercialized version of that place. I love your to do list 🙂 Beautiful pics give one a sense of the place and the pace of life. Wow, the photos are beuatiful and your outfit looks gorgeous! Looks fun. Italy really is a beautiful country, so much to see, one day I hope to travel to Sicily. Your photos are gorgeous. Very Beautiful pictures! I would love to go one day. 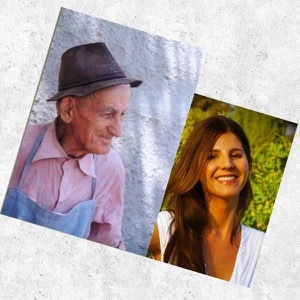 my grandparents were from Sicily so I have a special relationship with this wonderful island. glad you enjoyed it! Such beautiful photos! Makes me want to go hop on a plane right now!! I have always wanted to go to Italy… I haven’t been there yet but it is definitely on my list of places to go. Your images are beautiful! Looks amazing! One of my bucket list countries to visit! Beautiful photos! Not sure which is better, the food or the pics of Italy! Great post! Sicily is within our list of Top 10 places to visit in world. 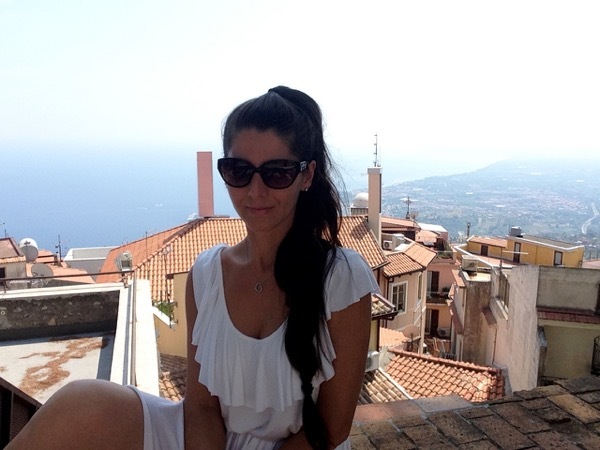 Your pictures just made me crave a Sicilian vacation right now. 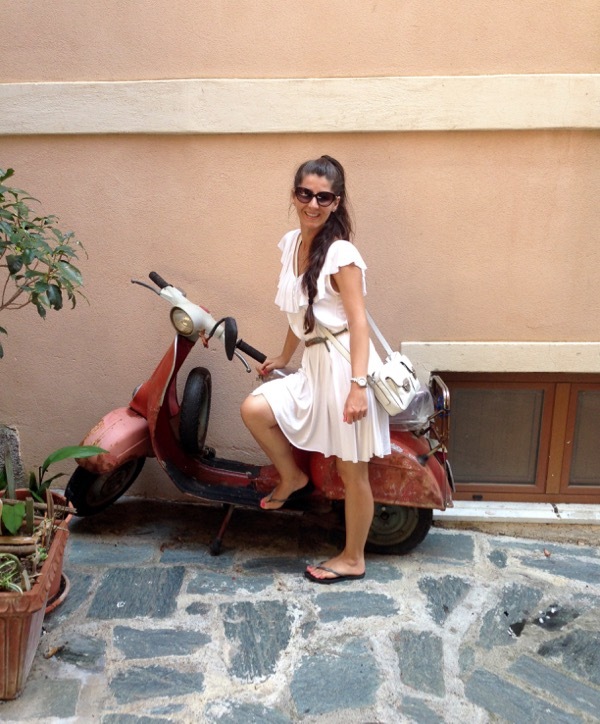 So much fun with all the great food, scenic places and shopping – what more a girl can ask for 😉 You seriously look like a Model esp in the pic with vespa -Hugs! blushing 🙂 Molly this is a girl’s dream come true. I hope you book that flight soon. What an amazing trip and photos! Enjoyed the photos. Looks like you had an amazing trip! Thank you Oana ! I just tried to portray a real glimpse of the life there, I really hope you make it to Sicily soon. What an amazing trip! I’ve always wanted to visit Italy, and if I do someday I will for sure refer back here to this post! Of course you will ! Rome has been on my bucket list for many years. This will surely be of much help planning our trip for next year. Gorgeous! Gahh gorgeous. I would so love to go some day. Ah man, I miss Italy. I’ve been all over, but you make me want to go back and enjoy the good eats. Awesome pics, thanks for sharing! Florentina…wow..some of these photos look like they could be paintings..brilliant! I would LOVE to go to Sicily. My brother in law is from Italy, so all the Italy talk has always made me want to visit! why Thank you, i’m flattered, IPHONE forever 😉 I really hope you go, it will change you, Sicily has a way to get in one’s soul. Oh, how I’d love to take this trip! Marvelous tips!! Sicily sounds and looks amazing! Thanks for sharing your trip with us! Yummy food too! That trip looks fantastic! I’m so so jealous right now 🙂 I’ve been to Milan and the Gelatos were to die for. Can’t wait to visit Sicily after your post. What a fantastic trip, I love all your adventures! Would love to visit Sicily one day! The pizza and ricotta shells sound delicious! Beautiful pictures, and looks like a wonderful vacation! What a beautiful location! Sounds like you had an amazing time! Yes it was absolutely a scene out of a movie. Wish it lasted longer of course. Oh my gosh girl, I am SO JEALOUS! It’s a dream of mine to go to Italy, Sicily especially. And I love that white dress! I would hop on a plane right now and go if I could! It looks so beautiful and I’m sure the food is amazing! yes and yes, I hope you get a chance to go someday, Sicily will stay with you forever. 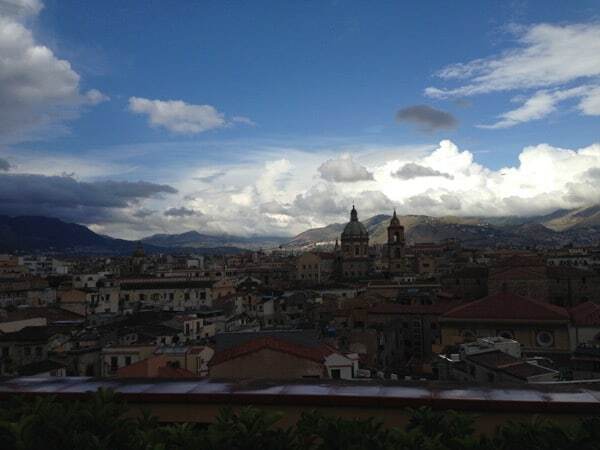 awww Italy is a wonderful place to visit, but Sicily has a magic you’ll be carrying for years to come.